This is one of the rarest brewriana collectible one will ever see or perhaps own. More pictures available. 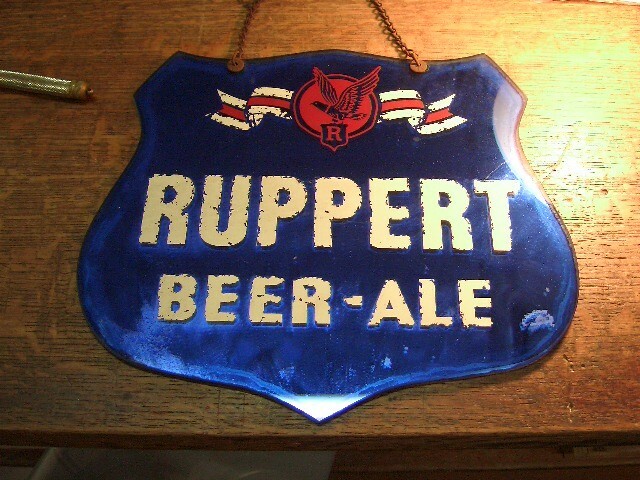 It was an adv beer mirror for Ruppert Beer-Ale when Babe Ruth and Lou Giehreg played for the the owner of the Yankees in 1920 and own the Ruppert Brewry. His name was Ruppert Knickerbocker. Not sure I have spelling correct. This is one of the rares Advertising signs one will ever find. Approx 12" X 13"
This is one of the rarest brewriana collectible one will ever see or perhaps own. More pictures available. It was an adv beer mirror for Rupert Beer-Ale when Babe Ruth and Lou Gehrig played for the the owner of the Yankees in 1920 and own the Rupert Brewery. His name was Rupert Knickerbocker. Not sure I have spelling correct. This is one of the rares Advertising signs one will ever find. Approx 12" X 13" Please email cowboyron@cowboycabin.com with questions or call 406 270-2842.